chlorine pool | Master Pool Service, Inc. Swimming pools are a wonderful addition to any yard. Most of our customers like to have their pools open before Easter. Some of our customers, on the other hand, wait until after the spring pollen season is over to open their pools. Either way has its benefits and drawbacks. Before Easter, your pool will be subjected to the yellow haze of Georgia springtime. Your skimmer is capable of handling this, and just a few minutes with a brush and net will keep your pool welcoming even through the worst of the pollen days. If you wait until after the spring pollen season, the initial opening time will be a little longer. Cleaning up of the accumulated pollen takes a little bit longer and can result in higher initial costs. All openings include a cleaning, making sure the filtration system is fully operational, and installing of the ladders and returns. We allow ninety (90) minutes for each opening. Chemicals are an additional cost, and we will be more than happy to use yours, should you have your own. 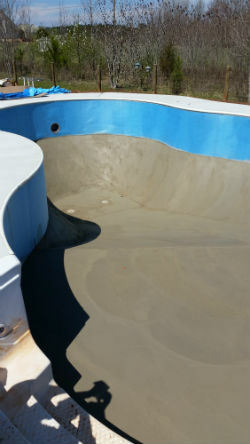 Please be aware, should your pool be exceptionally dirty, addition visits may be required to achieve crystal-clear waters resulting in higher opening costs. This entry was posted in Maintenance and tagged chlorine pool, Conyers, GA, Georgia, Gwinnett, Henry County, McDonough, Monroe, open my pool, pool advice, pool chemicals, pool cleaning, pool maintenance, pool opening, pool service, Rockdale, salt pool on February 20, 2015 by OM.